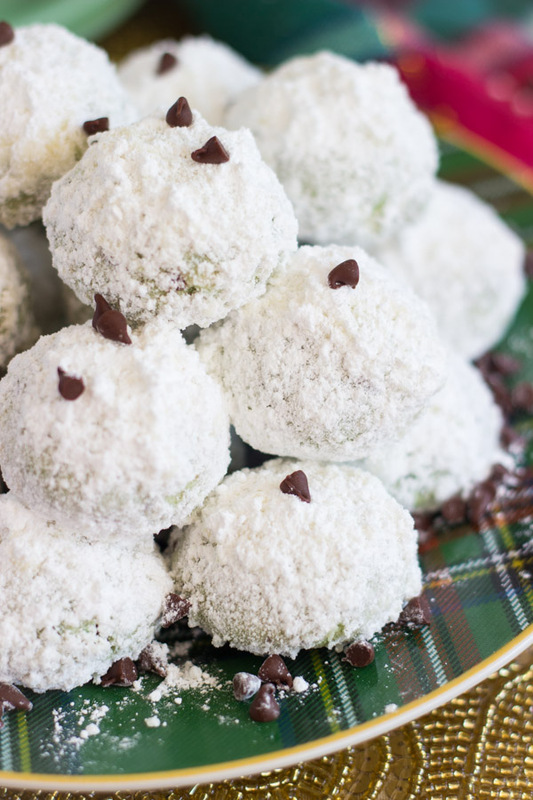 Last, but not least: Mint Chocolate Chip Snowballs! 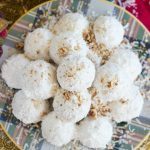 I can’t believe I said I was going to do a Snowball week, and I actually got every.single.post up for Snowball week, and on time! I planned to do one every day from Monday-Friday, and I DID IT. Things never work out as I plan, so I’m very proud that it actually happened. 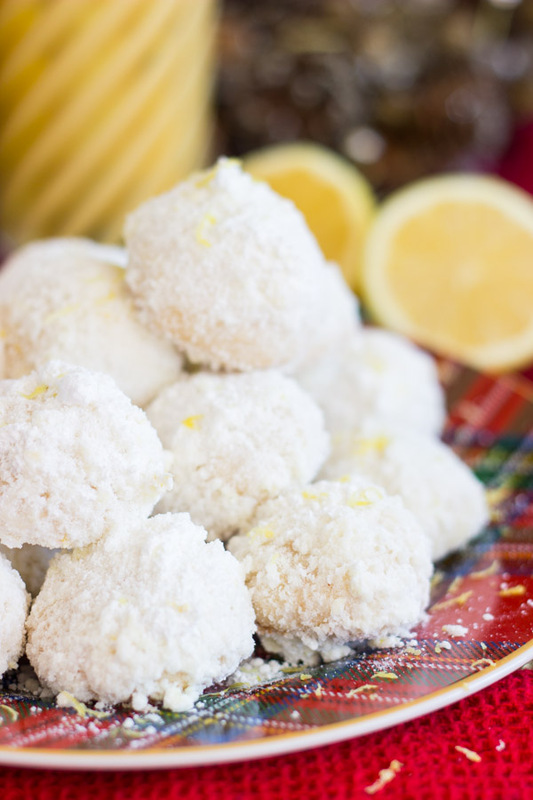 Last night I drank wine, watched football, finally worked on some Christmas shopping online, ate popcorn, and ate the last of the Snowballs! They’re ALL gone. 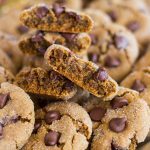 I gave a ton away, S.O. 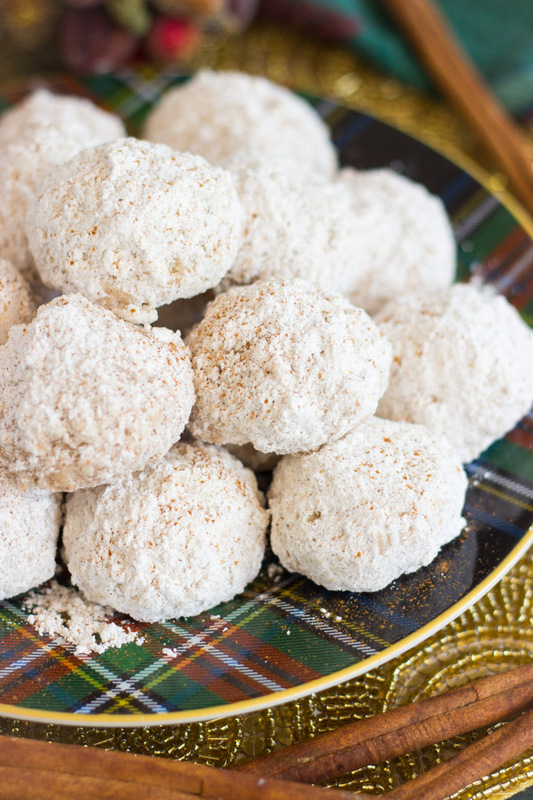 took them to the office holiday party, and I simply ate a lot of them. 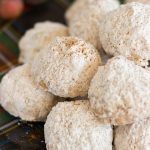 15 dozen or so Snowballs, and the well has run dry. 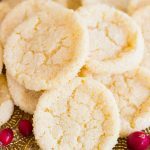 I have two more Christmas cookie recipes coming your way, a cake, and I have a few Christmas brunch recipes too, so we are still not done yet. Keep checking back! Meanwhile, I haven’t planned a single thing for New Year’s Eve – I never do. 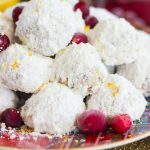 I really don’t do anything for that holiday, so how can I portray that I do? Maybe next year (I say that every year!). 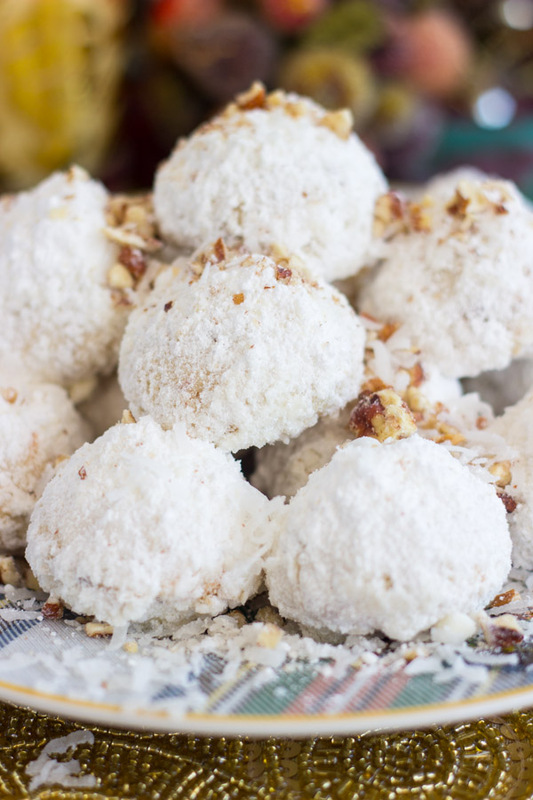 To recap, we’ve covered Chai-Spiced Snowballs, Cranberry Orange Snowballs, Lemon Snowballs, and Coconut Pecan Snowballs. 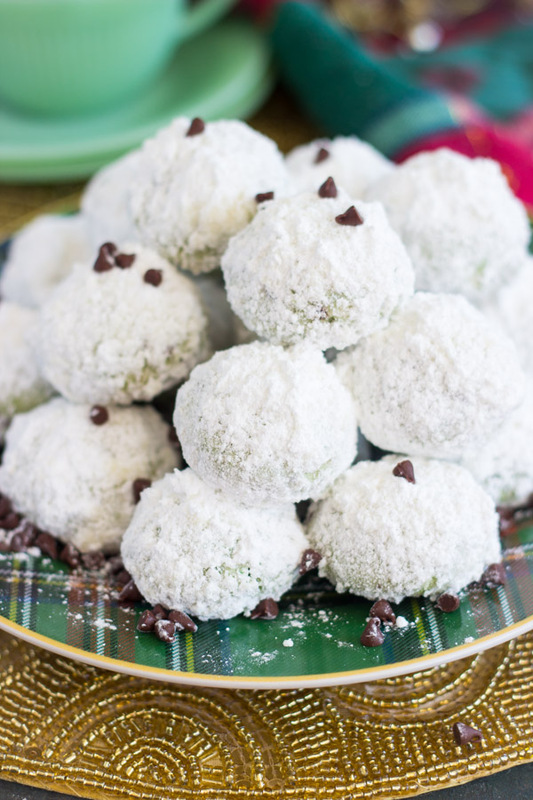 Today I’ve got Mint Chocolate Chip Snowballs for you. 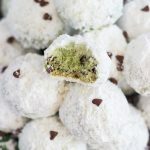 With a little bit of mint extract, mini semi-sweet chocolate chips, and green food coloring, you transform regular classic Snowballs into Mint Chocolate Chip Snowballs. 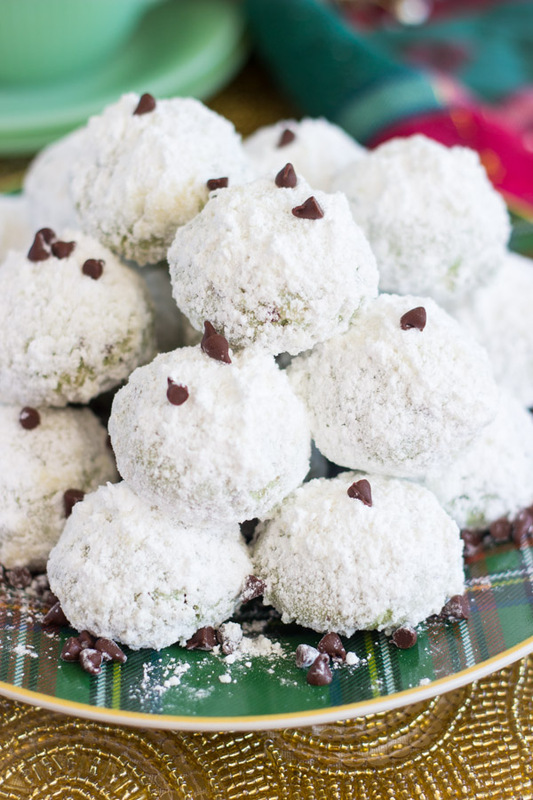 Every variation of Snowball only takes a few ingredients, and you get a whole new cookie. Isn’t it fun? The flavor options are pretty limitless. 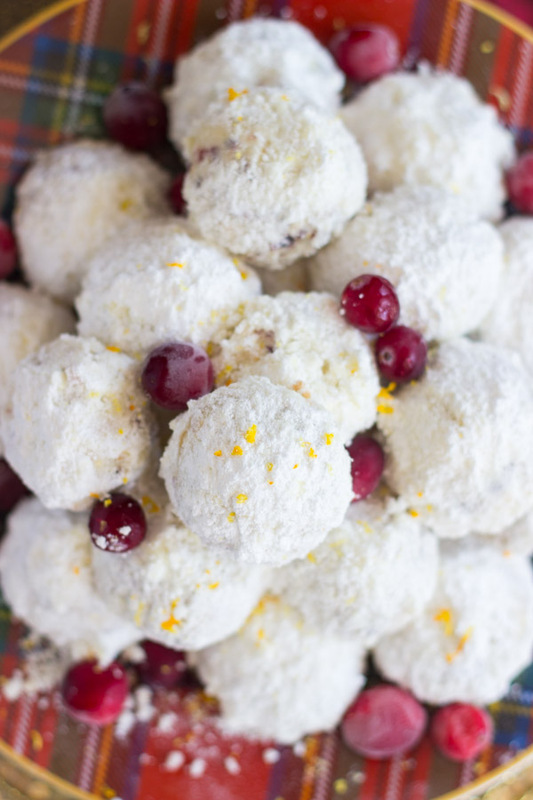 Everybody loves Snowballs, so you can create a Snowball buffet for the holidays! 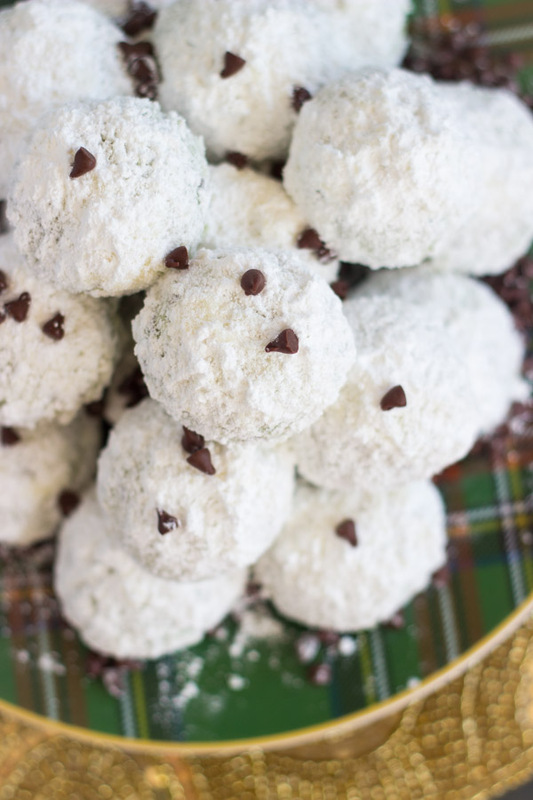 Classic Snowballs spruced up with mint extract and mini semi-sweet chocolate chips! 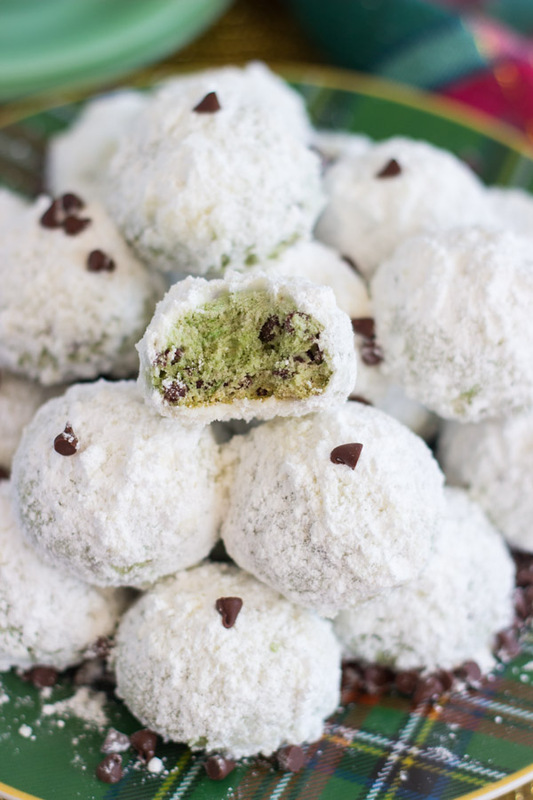 In a large mixing bowl, beat shortening, 1/2 c. powdered sugar, flour, green food coloring, mint extract, and vanilla, until well-combined. Beat in chocolate chips, until just blended.